In each other? Did we show him any interest and likewise he in Tulane? Are his knees shot? Inquiring minds wish to know? He would have a chance to shine in our system. He can't throw the ball. It's why he remained 4th on the depth chart. We can and must do better at this position. Hopefully this season helps us recruit better there. I think Fritz would sign him in a heartbeat if he has any interest in Tulane. His skill set did not fit LSU's offensive system. it does fit the one at Tulane. Narcisse may be the best athlete on that team yet he basically hasn't played football in ,what, four years? He is the wildest of wild cards. Some back up(s) will blink at LSU same as Scott did last year and same as QBs at Clemson, Bama, OSU and even lowly Tulane where #2, #3 and #4 left last January. It's the nature of the system and doesn't tell us anything other than football HCs hate rotating QBs. With Burrow apparently now starting, I do agree with several here in that McMillan is most likely to leave first. With USM QB transferring in, I humbly guess none of our buds up river are headed this way but that's not much more than sticking a finger in the air to see which way the wind blows. 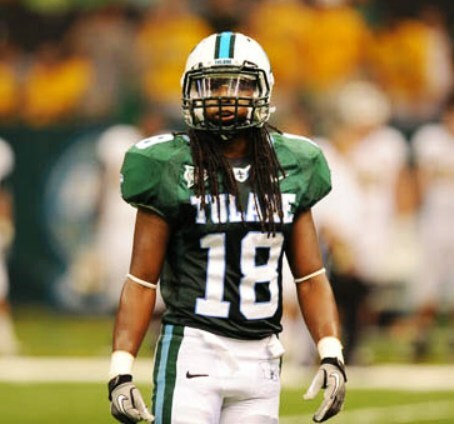 Meanwhile after watching Canteen get hurt, Tulane's season is all about keeping Banks on the field. On edit: HAH! You can tell I like YOGWF so much I check it before the daily paper and Tiger Droppings. I think Advocate beat reporters have it right: it's McMillan leaving after Narcisse which is now official. Hope LSU likes Burrow and Brennan. A lot of their fans think he'll try Auburn after a JUCO season but I think they don't need him. If he would be interested in Tulane I'd say yes, give him a scholarship. This opinion is based on my observance of QB play at the Spring "game". I would have given that same answer last year based on what I saw of Banks at that spring game. Anyone else remember how he looked? He couldn’t make a throw from the pocket to save his life. I think the staff needs to wait and see how their QB’s are doing at the end of the season before running after some former blue chip washout. I think it depends on how the staff feels about Keon Howard, Christian Daniels, Dane Ledford and whoever else we could potentially sign. We certainly need at least one more QB (if not 2) for this class. Narcisse's injury history would definitely concern me. He's torn 2 ACLs and hasn't played in a real game in a LONG time. I say you play wait and see. Recruit him but don't commit to him until you see him on the field. Per his radio interview this morning he is going JUCO and then FBS. Probably the wisest decision for his best interest to show he is 100% healthy and the player he was recruited to be. Will give us plenty of time to evaluate him and him to evaluate us. Of course it also gives Alabama, Auburn, Clemson and the other schools that offered him (and any new schools) time to do the same. If he proves himself it will be a dogfight to get him and we'd be lucky to have him. A strong, injury free, season by Banks should go a long way to helping our QB recruiting. Our current back-ups aren't the future at the position. We have brought in an experienced transfer. a grad or JC transfer would be good for next year along with at least one HS signee at the position. If we are going to make this work long term a priority has to be made of properly stocking this position. This season is extremely important to what we'll be able to recruit at the position. so, did you type that already knowing he was leaving? I typed it not knowing his leaving was official until I read the paper. But I certainly was the least surprised person other than Orgeron and Ensminger. Who wants to ride the pine for years while always thinking you're always one hit (or legal/academic issue) away from playing a lot? Obviously not Scott, Narcisse and McMillan, et al. Narcisse to me still projects All World but then why as LG implies is he fourth string? Also I'd have the Canteen concern. His body may simply be on the wrong side of the football equation after two ACL operations. But with 85 scholarships, I'd invest in him. All just my view. But yeah I'd take McMillan now as insurance against the resurrection of the spirit of Buddy Gilbert in 2018 which Banks is one hit away from. There are murmurs that Narcisse has personal reasons to stay close to or in LA. Not really sure what was meant by them. Maybe he has a child or something like that. I know his father died when he was in high school. If so it probably changes the nature of his recruitment. What kind of a season do we need to have this year to actually end up IN a race against those schools for any player? Forget them because if we wind up in the running it won't be against them. If we go after either one, get a commitment before October 31, otherwise move on to kids we actually have a shot to get. Like Wavedom said, we need to score big in this area to solidify the position going forward. It is the most important position on the team and currently has the worst depth chart by far. WF has to figure this out now. I am exhausted chasing ex-LSU qb’s. McMillan, who most fans thought looked the best in the spring game, has already graduated and will be looking for a place to play now. He isn’t coming here to sit on the bench like he would have in BR. Pray tell where is that in the FBS? First games for 125+ teams are in next two to three weeks. I'm truly just curious on this. This isn't JUCO roster where a Scott or Narcisse can move to the top immediately. Meanwhile we know McMillan ain't Russell Wilson. Even FCS might not work. If you believe this pundit, Brantley who has been at Eastern Illinois since January is looking at being a backup this year. Exactly. The kid has to be targeting 2019 if he is honest with himself. After glimpsing at the linked article it appears that Brantley's new team runs the Air Raid offense. Why he is there? Brantley had a hurt shoulder early in his time here. He can throw the ball well enough to run and succeed in that offense. And then, after the season, do you think there was anything to prevent signing a Narcisse-equivalent? Banks was miles better than anyone we've had in recent memory, but objectively he was what, maybe a C+/B-? Even before the season was over the staff put a great effort into signing a Narcisse-equivalent. Objectively your grade is fair but I would emphasize his very noticeable improvement from start to finish.